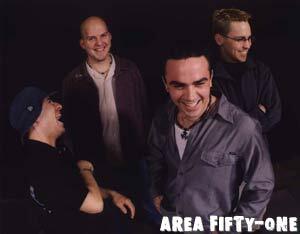 Area Fifty-One is a four piece rock band based out of Windsor, Ontario. Their music relies heavily on great melodies, vocal harmony, and rocking songs from start to finish. The band consists of Mike Edmunds on lead vocals, Brett Humber on guitar, Sparky on bass, and Joel Carrier on drums. The band has been together for seven years and played over 1000 shows. Highlights include opening slots for the Matthew Good Band, Edwin & the Pressure, 54.40, Big Wreck, and J.Englishmen.